Is most of SQT’s training done in-house? About 60 percent of our training courses run in-house, and we run the remainder on a public basis. The majority of our public courses are in Dublin. However we do run our courses in other locations around the country. As well as offering our public courses on an in-house basis many of our in house courses are customised and bespoke. You have provided training for big companies such as eBay, Kerry Group and Pepsi. Do you work with smaller companies too? Yes we work with a wide range of companies. Many of our customers are SMEs, as they would be typically training smaller numbers they would join our public courses. This gives them the added benefit of connecting with other companies and share learnings. We also work in a range of sectors, private, semi state bodies and public sector organisations. You do a huge range of courses. Which are the most popular? Lean Six Sigma, Quality and Food Safety are our more popular courses. However, we have certain specialised courses which are very popular within their field. Our specialised Calibration course within our Continual Process Improvement suite of programmes is extremely popular. Is there any training course you think all companies should ideally do? Our leadership and continuous improvement programmes benefit any organisation from SMEs to larger organisations. These courses work with individuals and organisations as they grow and enhance their leadership and interpersonal skills. These programmes will build upon existing skills while learning new tools to help employers and employees to reach their full potential. How do you tailor them to suit a particularly company’s needs? Sometimes a company will know exactly what they want from their programme. Other times, they may need to some help from our experienced tutors to identify issues and provide solutions. We take the insights provided by the company, design a detailed training programme and provide a proposal to ensure all their training needs are met. When an organisation uses customised content, it makes it more real for the learner. As a result, it improves the learning process and the transfer of knowledge back into the workplace. You’ve being doing training for over 25 years. Are there trends in training that you’ve noticed over that time? At an individual level there is growing emphasis on lifelong learning and Continual Professional development (CPD). Given the economic cycle of the past 10 years, people are more aware of the how important it is to keep their skills up to date with industry demands. From an organisational point of view, the labour market is getting more competitive. That means that organisations have to develop skills in-house as well developing talent in order to attract and retain a strong team. Tells us a little about the benefits of Lean Six Sigma. What do students find most challenging about this course? The LSS QQI L7 and L8 courses are challenging technical courses. They contain a broad field of learning including problem solving, change management, innovation, project management, data analytics and of course Lean Six Sigma techniques and tools. Apart from learning new tools and techniques students have to demonstrate their knowledge in real world projects that deliver real benefits to their organisations. Students unfamiliar with data analytics also find that learning to use statistical software can be quite a challenge. Tell us a bit about SQT’s teachers and instructors? 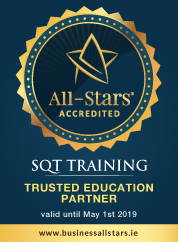 SQT’s tutors are all proven experts having all worked in industry and are considered to be leaders in their field. We believe, in this field, students learn best from seasoned industry experts, not just academics. That’s why we so carefully hand-pick every single tutor. People who have worked at the coal face, who can draw on their experiences and share real world insights, stories and techniques. These tutors endeavour to empower and inspire you. What is the ideal group size for in-house training? The ideal size for training is between 10 and 15 people. In your opinion, other than a willingness to study, what are the most important qualities a student needs to succeed? What makes training successful in the long term is support from management within their company. Students also need to be able to apply what they have learned in the work place. Students also benefit from speaking to management about their training and how to apply it to their role. Continuous application of the elements of the course ensures that the student succeed and provide a return to the organisation. We encourage all students to practise, practise, and practise. For more information about SQT Training and their courses on Nightcourses.com please click here.